The A. hispida is a great hanging plant with striking pendant red flowers. There's a good reason people have been using acalypha plants for the past 50 years. They're tough, they're pretty, and they come in varied forms to suit a number of uses. In terms of houseplants, the most popular Acalypha is a pretty trailing variety known as A. hispida, but you can plant almost any Acalypha inside provided you give it the right conditions. Your biggest challenge, once you meet its basic requirements, will likely be the upright forms' tendency toward legginess. But keep it well-trimmed, and the plant will reward you with excellent color and interesting leaf forms. Light: Acalypha are definitely a bright-light plant. They don't necessarily like full sun, although they can tolerate it if acclimated. Indoors, look for a bright, but not sunny spot, like an east-facing window. All acalypha prefer warm temperatures and should not be kept under about 60 F if at all possible. Water: Acalypha like a regular supply of water, even during the winter months. They also do best with a high humidity level, so if your house is dry (most are), you will want to regularly mist your plant or keep it in a tray of pebbles. During the rest period, still water the plant, but reduce to every other week. 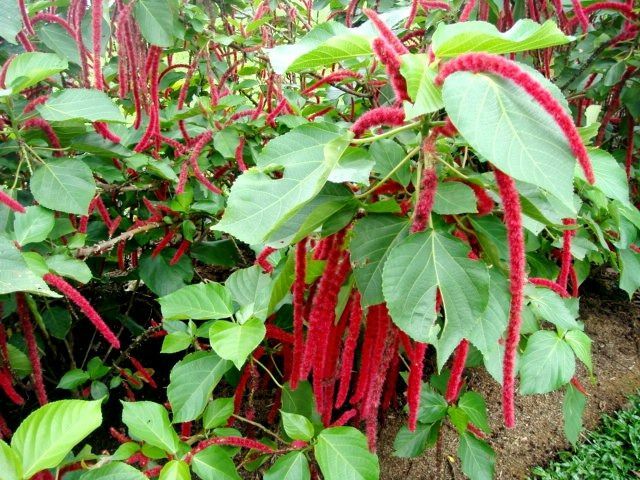 Fertilizer: Acalypha appreciate regular doses of fertilizer throughout the growing season. Liquid is best, but they will also thrive with a controlled-release fertilizer. During the winter months, cut feeding back or stop entirely. Soil: They aren't especially picky as to soil type. A well-drained potting mix will do. Acalypha propagate easily from stem tip cuttings. For best results, take a cutting in the spring, when the new growth emerges. Use a rooting hormone and plant the cuttings in seedling soil. Acalypha propagate most easily with high humidity, so encase the pot in a plastic bag and keep in a warm, bright (but not direct sunlight) spot. When new growth emerges, remove the bag and move the plant to its more permanent location. Depending on the type of acalypha, they are relatively fast-growing plants. However, they also tend toward leginess. In the first few years, you might want to repot annually, in the spring time. Step the plant up one pot size every year. Once the plant has reached its ideal size, repot every other year or annually into the same size pot and root prune and trim the branches back aggressively. Most acalypha species can withstand fairly aggressive pruning (up to 25 of the plant's overall foliage) and still thrive. The A. hispida is a popular trailing plant with bottle-brush like flowers that hang in pendant, red tails. This plant is a rapid grower and forms a wonderful indoor color display. For interesting leaves, it's hard to beat the A. wildensiana, which features large, crinkled leaves with interesting leaf margins. A number of varieties are available, including the A. wildensiana 'Goldsefiana', which has light green leaves that are rimmed with white. First, be aware that acalypha is toxic. All parts of the plant are poisonous, from its leaves to its seeds to its stems. If you have pets or children that are likely to try eating the plant, you should avoid acalypha. If that's not a concern, the trick to growing healthy acalypha is to provide plenty of humidity and lots of even moisture. Plants that are dry are more prone to leaf-drop and pests, as well as general decline. If you cannot provide plenty of ambient humidity, try more regular applications of water. Acalypha is also more sensitive to cold than other subtropical plants and will tend to drop leaves if they are exposed to cold, dry drafts. Finally, Acalypha is vulnerable to mealybugs and aphids.